Gov. Phil Scott and legislators who make up the Emergency Board meet Friday in Montpelier to discuss state revenues. Gov. Phil Scott and Vermont legislative leaders who make up the state’s Emergency Board agreed Friday afternoon to lower expectations for state revenues in the coming year and to plan for $12.5 million in budget cuts. The action came after economists — one hired by the governor's administration and another hired by the legislature — warned that all is not rosy with the economy, nationally or in Vermont. The state is expected to see $28.8 million less in general fund revenue this fiscal year, economists Tom Kavet and Jeff Carr said. The sales and use tax is among those that has not been as robust as expected, they said. Those taxes could recover this year as more online retailers charge state sales tax, but Kavet warned that Vermont's aging population can also be expected to buy fewer goods. 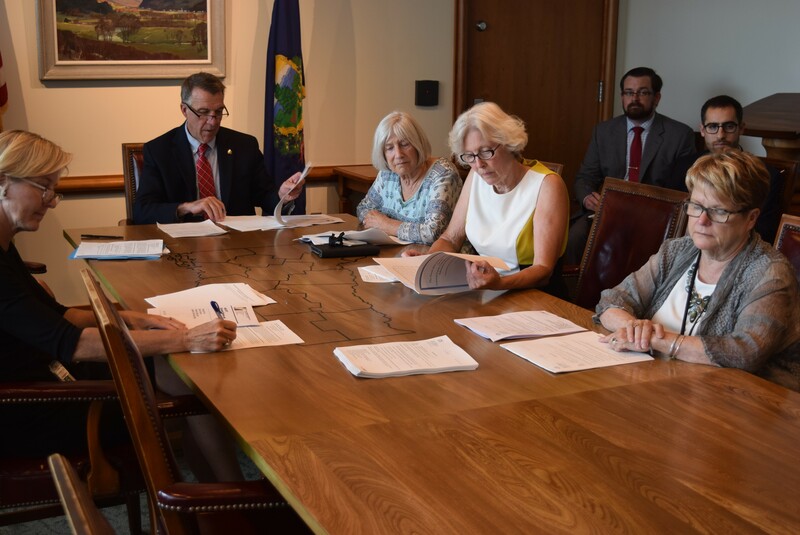 The governor and the four chairs of the House and Senate money committees agreed that $16.3 million of the revenue decline could be made up with various one-off funds, including $1 million saved on a new office supply contract. Scott said his staff has started to look for ways to make up the rest with budget cuts. Those ideas will be presented to the legislature’s Joint Fiscal Committee in August and will be the subject of a public hearing. “Twelve million is still a lot of money,” Scott said after the meeting. 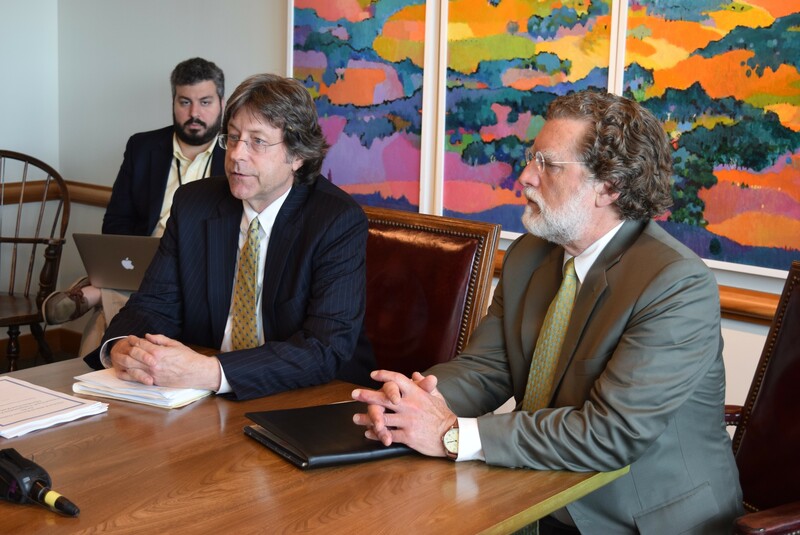 Economists Jeff Carr (left) and Tom Kavet address the state's Emergency Board on Friday. In their twice-yearly report to the Emergency Board, the two economists painted a picture of moderate economic sluggishness. The post-presidential election economic surge isn’t lasting, they said. Kavet, hired by the legislature, was the most blunt about it. “The post-election ‘Trump bump,’ which raised expectations of stronger near-term economic growth via lower taxes, increased infrastructure spending and reduced regulations, has fizzled amidst the dysfunction of an often chaotic federal administration in its first six months,” Kavet wrote in his written report. Though the state enjoyed a low unemployment rate of 3.3 percent in 2016, jobs in the manufacturing sector declined 4 percent from 2016 to 2017, Carr said in his written report. Jobs in the typically low-paying leisure and hospitality sector were the strongest, with a 3.4 percent gain. Scott acknowledged that the economists’ reports had some discouraging takeaways. No More Mr. Nice Guy: Will Scott's 'Hardball' Approach Hurt Him? Governing by Numbers: Is Scott's 'Six-Three-One' Slogan Good Public Policy?